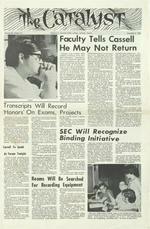 'I Cassell 1966 Faculty Tells Cassell He May Not Return Secondyear student Mike Cassell, chairman ofthe Stu dent Executive Committee, has been informed "upon the recommendation ofthe Academic Cotmcil and with the reat firmed consent of the Faculty .. that he will not be permitted to retum to the College in January. 11 According to a statement issued yesterday by Dr. PeterBuri, Chairman protem of the faculty, Cassell was dismissed for f ail in g to tum in a satisfactory Independent Study Project report from the second independent study period last year. Cassell, who the report says had twice previously failed to submit a satisfactory Independent Study projectreport, was told by the faculty after its meeting Sept. 14 he would be dismissed from the College unlesshe submitted a satisfactory report by Nov. 25. 11He has failed to meet this obligation, Burl's statement said. When contacted early this morning at his home in Canton, Miss. Cassell said he had not yet received the 1 e t t e r informing him of the action. According to several faculty m e m b e r s the 1 e t t e r was m a il e d this morning after it was discovered Cassell had already left campus. Several faculty members said they thought he was still on campus and would therefore be in or m e d of the action before the news leaked out. Obviously shocked and stunned by the news, Cassell said, "I don't know yet what I will do. He repeatedly emphasized his desire to contesthisdismissal and remain in school saying, "It means too much to me" not to try and stay in. C a s s e 11 said he would contact college officials soon and indicated he "might fly back" in order to talk with them personally. According to Dr. Arthur R. Borden, Chairman of Humanities Division, Cassell signed for an independent study project with philosophy professor Dr. Douglas Berggren but then tmdertook to write an original musical composition forchc ral director Jerome Meachen without officially changing. endoftheterm, Borden said. Cassell was urged to change projects and was given a free choice of new advisers, according to Borden. Cassell chose to work in philosophy with Dr. Gresham Riley, assistant professor of philosophy. When Cassell handed in the paper on Nov. 28, it was judged tmsatisfactory. An<1 otner p= ot LOUege Hall, according to Kenji ?